The day after classes end (“Reading Day”) is often the first chance that many Towson University students have to take a deep breath and prepare for final examinations. 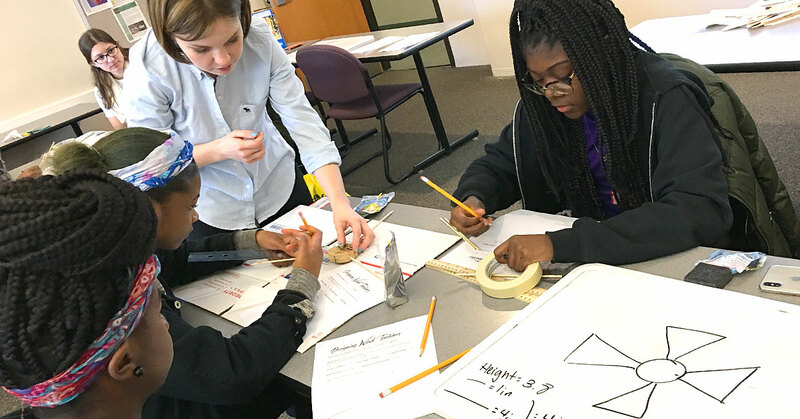 However, for a group of TU students and faculty, this past Reading Day offered an opportunity to host a group of local elementary and middle school students as they visited Towson University for a STEM Day field trip. 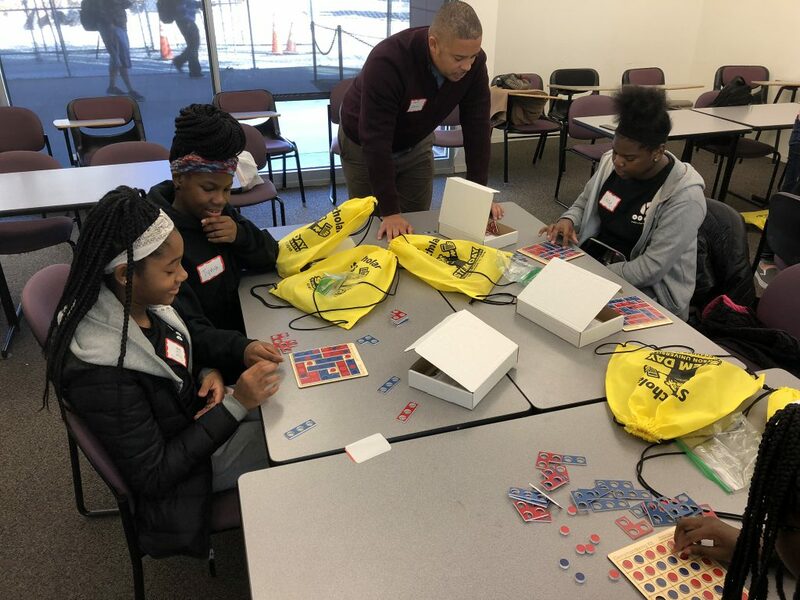 Forty students from Brehms Lane and Afya Public Charter Schools, two schools in the Afya Baltimore Inc. (ABI) network serving students in Baltimore City, participated in the STEM Day field trip held on December 11, 2018. The STEM Day field trip got its start in November 2015 when Dr. Diana Cheng (Associate Professor, Department of Mathematics) and Dr. Honi Bamberger (Professor Emerita, Department of Mathematics) organized the initial event for a group of 18 middle school students from Afya Public Charter School. The inaugural event has developed into an annual event, and thanks to the generous support of BTU—Partnerships at Work for Greater Baltimore, we were able to expand this year’s STEM Day field trip to also include students from Brehms Lane. 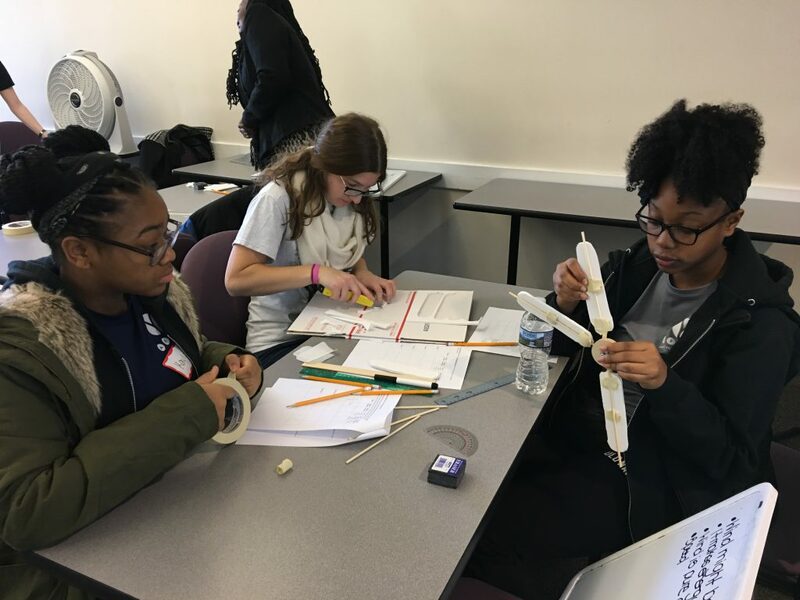 During this year’s STEM Day field trip, the students participated in workshops which focused on ways in which STEM is used in a variety of contexts. In addition to the workshops, the students were afforded a taste of campus life by participating in a tour led by TU undergraduate students. The field trip participants interacted candidly with TU faculty and undergraduate students during a hosted lunch. The STEM Day field trip also provided an incredibly rich experience for the TU undergraduate students from the College of Education and the UTeach program who volunteered their time to support this engagement. These future teachers were provided with a unique and authentic opportunity to engage with the types of students they hope to one day teach. 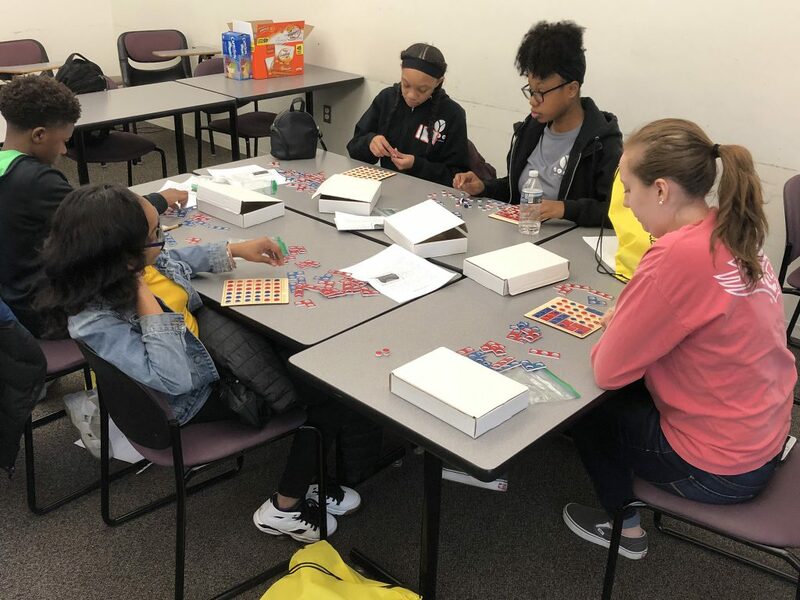 The elementary workshops were designed and facilitated by undergraduate students enrolled in Ms. Nicole Winner’s (Lecturer, Department of Mathematics) “Teaching Mathematics in Elementary School/Supervised Observation in Elementary School Mathematics” course (MATH 323/324). The mathematics workshop consisted of escape room activities. Students worked collaboratively in teams to solve mathematics problems in order to “escape” and find the puzzle. The science workshop involved a scenario in which students were stranded on an island. They incorporate math and science skills to create a raft in which to escape the island, and a catapult in which to defend themselves against pirates. The middle school science workshop was facilitated by Dr. Diana Cheng with the support of four undergraduate students. During this workshop, Afya students learned about the impact of climate change and the use of wind turbines as an alternative energy source. 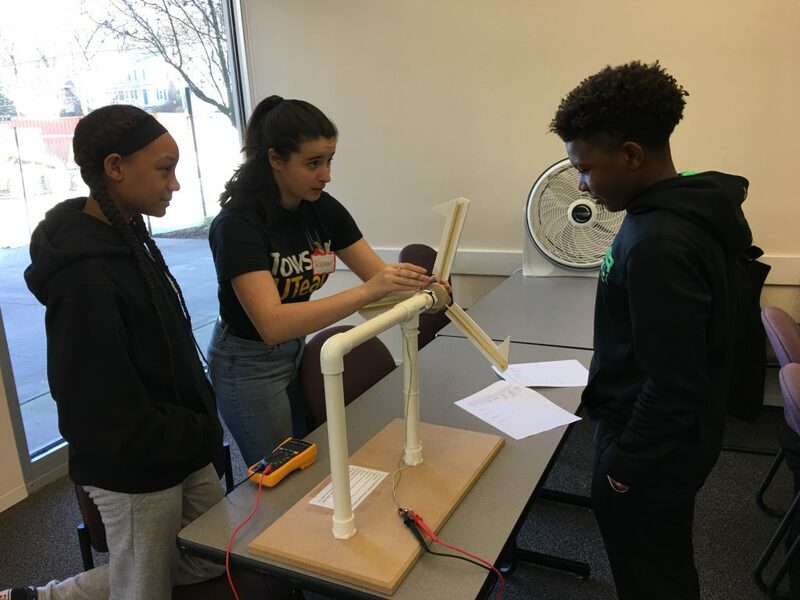 Students worked in teams to design and fabricate wind turbine blades, which they then attached to a hub to measure the voltage produced by their designs. The activity handouts were designed by UTeach secondary mathematics education student Rachael Talbert, with support from the Kahlert Foundation; and the materials were constructed by Dr. Jane Wolfson, professor emeritus in the Department of Biological Sciences, with financial support from National Science Foundation Grant No. 1043262. The middle school mathematics workshop was facilitated by Mr. James Rutter (Doctoral Candidate, University of Virginia, Curry School of Education) with the support of one undergraduate student. During this workshop, Afya students completed a series of mathematical puzzles using the Make to Learn Gerrymandering Game to develop an understanding of gerrymandering. Students were asked to represent a series of scenarios in which there was a clear discrepancy in the outcome of the popular vote and the district representations. One of the Afya students was particularly fascinated by the concept of gerrymandering and was able to generate a scenario in which an equal distribution of voters (i.e., 50% red tokens and 50% blue tokens) resulted in an incredibly skewed district representation (i.e., 25% blue and 75% red). In addition to providing funding for workshop materials and lunch for the students who attended the STEM Day field trip, BTU support allowed each of our field trip attendees to leave with a custom designed Towson University STEM Day drawstring bag filled with resources to encourage students to further foster their interest in STEM. Thanks to this engagement, TU faculty and undergraduate students have the opportunity to further strengthen the relationship between Towson University and ABI schools. We are currently developing additional workshops for the students at Afya Public Charter School that we hope to implement in the spring semester. By working with BTU, we learned about projects led by other TU faculty at Afya Public Charter School and are in the process of collaborating our efforts to have an even greater impact on the community. Kimberly Corum, Ph.D., is an assistant professor in the Department of Mathematics. Dr. Corum primarily teaches mathematics content and pedagogy courses to pre-service elementary education and secondary mathematics and science education students. 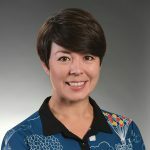 Her research interests include mathematics teacher preparation, mathematical problem solving, and the use of maker technology in the teaching and learning of mathematics.